(CNN) -- The operator of the trolley that rear-ended another trolley Friday night in downtown Boston, Massachusetts, has told investigators that he was text messaging at the time of the accident, which injured 20 people, a transit official said. 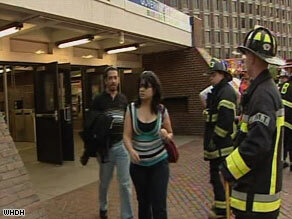 Passengers walk past firefighters at a Green Line station in Boston after trolley collision Friday evening. "The operator of the striking train was interviewed at the hospital by two detectives," said Daniel Grabauskas, general manager of the Metropolitan Boston Transit Authority. "He admitted that he was texting at the time of the accident." Grabauskus said the operator told detectives that, when he looked up, "it was too late as he applied the brake and the train struck the other trolley." Grabauskus described himself as "outraged." "We have reinforced for a number of years that the use of cellphones or any other kinds of electronic devices while operating a train or a bus is absolutely prohibited," Grabauskus said. Though the investigation is ongoing, he said, the 24-year-old, two-year veteran will be fired if his version of events is confirmed. None of the injuries was considered life-threatening, the MBTA said. The incident happened at 7:18 p.m. as the Green Line trains were traveling between the Park Street and Government Center stations in downtown Boston. Both trains were traveling westbound when one trolley rear-ended the second, an MBTA official said.